The Englishman shot a final round 68 for a seven shot, wire-to-wire victory in the Maybank Malaysian Open to climb closer to the automatic qualification places for the side to face the Americans at Gleneagles in September. Michael Hoey shot a final round 69 to finish tied 18th on six under and earn €23,469 to move up to 35th in the Race to Dubai while Simon Thornton (exempt thanks to his win last year) is 122nd after a 78 left him 60th in Kuala Lumpur. But all the plaudits were for Westwood for his 41st win worldwide — a victory which catapults him to 15th in the Ryder Cup standings and to 30th in the world. As McGinley said after Westwood clinched a top 10 in the Masters: “Lee’s game is coming back and we all know how good he can be and the influence he has in the team room." 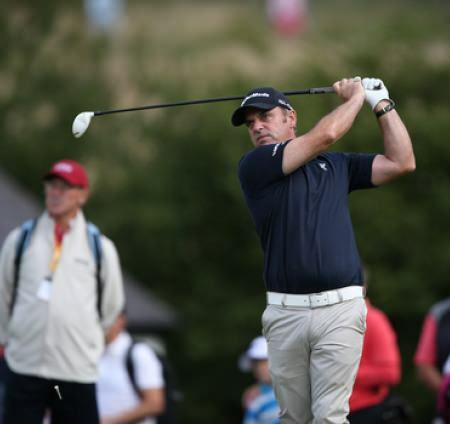 Belgian Nicolas Colsaerts, South Africa’s Louis Oosthuizen and Bernd Wiesberger all shared second spot on 11 under par as 40 year old Westwood started the final round one shot clear of Andy Sullivan and romped to victory. As Sullivan shot 78 to finish 11 behind, not even a mid-round storm delay of more than four hours bothered the winner, who added his fourth birdie to an immaculate card at the last. “I’m delighted to be back in the winner’s circle," Westwood said. "You have to play really well to win any tournament by seven shots. I started off one in front and that could’ve been a pressure situation, but I kept my foot on the pedal and didn’t give the other lads much of a chance. “I’m pleased that the work I’m doing with Mike Walker has paid off so quickly. I’ve been seeing the benefits on the range, but this week I’ve seen it on the course – and under pressure too, which is really pleasing. It’s a good time of year to be playing well because there are a lot of big tournaments coming up." His seven shot win was the largest of his career and possibly the most significant as he battles to regain the form that saw him become world No 1. “I started working with Mike Walker a few weeks ago and Billy Foster came back on the bag at the end of last year, so I was going back to what I had done before because it had worked,” said Westwood. At the PGA Tour's RBC Heritage at Hilton Head, there was another boost for McGinley as Luke Donald finished second to Matt Kuchar, who holed a bunker shot at the last for a seven under 64 to set the 11 under target and was never caught. Donald needed birdies over the closing holes to force a play-off but had to settle for a 69. The Englishman is also rebuilding his swing and may well be rounding into form in time to make the side. As for Graeme McDowell, who is targeting big performances in the US Open and The Open to seal his place in McGinley's side, he finished tied for 23rd at Harbour Town after a closing 71. The defending champion three-putted the last to finish nine behind Kuchar on two under after a lukewarm week on the greens.